Honestly, the best! I've had 2 of my daughters take their senior pictures with Craig. He was able to take their ideas and make them come to life. They were both nervous at first but he was able to make them feel comfortable and relaxed, the results shine through! I couldn't be happier with Craig, a true professional. I have 2 sons graduating here soon. One next year and the other 3 years from now. Moz is who I'm going with! Thank you, Craig! We have worked with Craig Lamere for over 5 years. He has taken our staff photos, 12 week challenge pictures, employee spot light photos, action shots in the gym and salon, building and equipment photos along with several of our staffs family pictures over the years. Craig even did a shoot for the Gold’s Gym Franchisee Magazine that is seen by millions of the people in world and featured in over 400 clubs. He has been AWESOME to work with and has played a huge roll in showcasing what we love and have a passion for. My fiancé and I did our engagement photos with Craig. We couldn't have picked a better photographer! He's professional, enthusiastic and has an amazing eye for lighting. I would recommend him to anyone, I only wish I lived closer so we could do more photo shoots with him. Thanks Craig! Moz studios is hands down the best option for photography. Moz is not the typical load the family up in matching turtlenecks and head down to the local Sears to sit in front of the "fall foliage" backdrop. Craig doesn't take basic pictures. He uses locations, different angles and lighting to create images that make a statement about you and your intetests. His talents cover all areas photography. My family has gone to Craig for multiple photography needs from senior pictures to big life moments and we will continue to do so. Craig takes your biggest moments to the next level by capturing your personality, love and uniqueness into images. Don't miss the opportunity to have your images be unforgettable. I’ve shot with Craig many times for business, daily and personal photography. He is fun to shoot with, easy to communicate with, and the photos are always amazing!! I highly recommend Craig. His expectations of himself are so high, you can’t go wrong. Craig is an amazing photographer. I have used him for both of my kids senior pictures and our family photos. He gets to know the kids personalities prior to the session so each photo session is unique to the kid or the family . Highly recommended, you won't regret having Craig capture your memories. Moz is simply the best. Craig has a very trained eye and is great at working with models or everyday people alike in getting them to capture the moment they are going for. His passion for photography makes him a great teacher and he explains the complex techniques he uses simply enough to make sense to beginners. He cares about his clients as people and he celebrates what makes them who they are and he brings it to the surface in an unprecedented fashion with every shot he captures. Hire him, pick his brain, and enjoy the masterpiece he turns you into. We at the Pocatello Children’s Clinic were fortunate enough to have Craig come and take our Physician and staff photo’s for our website, and then again he came and took candid shots for our advertising needs. He was professional, fun, and very quick (which is a must when you are a busy pediatric clinic!). The photos he took were amazing, and I would recommend Moz Studios to everyone! Friendly, Fast, Fun and the pictures turned out FABULOUS! We had Craig shoot our family picture, and it was painless! If you 've ever had to take family pictures you know how frustrating it could be to have EVERYONE looking their best, Craig was able to capture the very best of my family! He's so down to earth and open to suggestion! 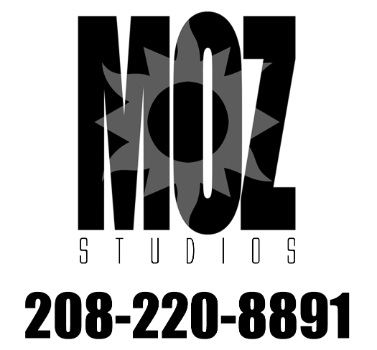 I have been getting pictures done with Craig at Moz Studios for 7 years now. From engagements to head shots to maternity pictures Craig has always been so professional and great to work with! He brings creativity to every shoot to make sure you and your pictures stand out! Craig is an Oustanding photographer! He has been taking our family pictures the last couple of years. He works excellent with children. Lots of patients and creativity. His glamor and boudoir pictures are unbelievable. He makes you feel very comfortable and captures stunning images. I don’t know how he does it but he is one of a kind! Best Photographer not only in East Idaho but in the Mountain West! You won't be disappointed! Craig is professional, masterful, and extremely personable. He loves what he does and you can tell not only by his work, but also the way he talks about it. This is a man who teaches photography WORLDWIDE - that's enough evidence that you'll be good hands when working with Craig. I wish I could give 10 stars!! I'm not someone who likes having pictures taken but it was honestly a really fun and easygoing experience, Craig's a cool dude. Craig is amazing! His photos are always top quality and he is so much fun to work with. When I took boudoir photos with Craig, he made me feel comfortable and at ease. Craig also took our family photos. We had a large group with lots of kids and he was so accommodating. I ordered some photos on canvas and they look awesome. I went in as a model for a boudoir session and wow! I am the type of person that doesn’t feel very beautiful but Craig made me look amazing! I even purchased photos after this session! I would definitely recommend him! I even attached a preview of one of the photos. He is just phenomenal!